Maxstor is committed to fulfilling the variegated demands of our clients by offering a wide collection of the Tool Cupboard. Our fabricated range of industrial tool cupboard saves 50 to 70$ of spaces required by shelving with high-density drawer storage and also saves more than 50% in wasted labor compared to a normal shelving installation. Our Industrial Tool Cupboard Manufacturer fulfill the purpose of storage of precious tools with systematic manners. 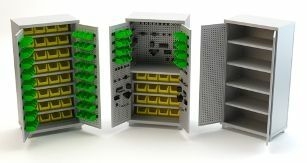 These cupboards help operators to make available the tools on demand. Smart design concept with partition and dividers; provide a maximum comfortable range of cupboard. We supply Industrial Tool Cupboard with 180° door opening. We also include features such as the door is opening wanes the exterior housing thus offers the best access to every stored item.